Mary Sylvester makes music in many different styles: Blues, Rock, Pop, Soul, Jazz, Reggae, and Gospel, but her heart belongs to Gospel-Music. It is the heritage of her ancestors. Mary Sylvester & Band received the famous ´Caribbean Music Award´. Her CD ´Gospel Joy´ sounds like live and has a challenging, modern drive. The CD Gospel Joy contains traditional Gospel-Songs, arranged by Mary Sylvester in her typical and unmistakable own Sound. As a special bonus-song is an original-song on the CD, written and composed by Mary Sylvester, ´Song For My Brother´. Gospel Joy, this Music comes from the heart, soothes, and makes you happy. 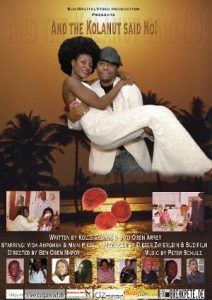 DVD-Movie / And the Kola Nut said No! The other world is a deeper universe, just as real as the veins beneath the skin, good and bad spirits that sleep in all of us until they are awakened. Just like the drums contain a Kola Nut, the soul of the drum, raising its voice, when the drum gets beaten. Every one of us has a spirit that talks to us with the beating of the heart, if only we would hear. The unique performance of the actors, well-written dialogues; moving, even heartbreaking scenes; and a view on African tradition which doesn’t lose its meaning with modern development, make this movie worth to be seen by many people!